Nerf Bars are typically a 3″ round tube that runs the length of the cab or from wheel to wheel. The Stainless Steel bars also come with a lifetime warranty. NWRB has a large inventory of in-stock items for same day service. Come by and see what they look like before you buy! 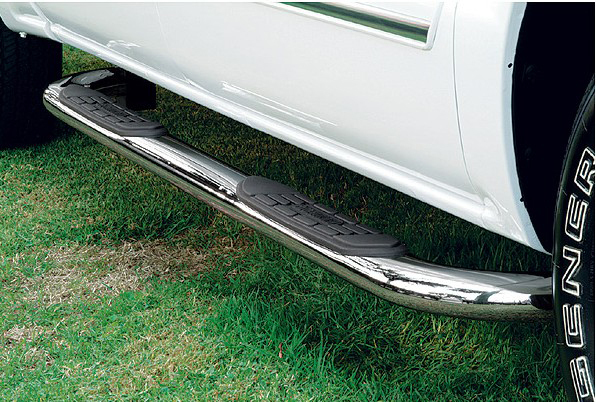 Step right up and discover the best selection of running boards, nerf bars and truck side steps in the Portland, Damascus, Oregon city or Canby area. Regardless of what you call them: truck nerf bars, step bars, side tubes, truck steps, sidesteps, truck step bars, step rails or truck running boards, these metal bars that run underneath your doors are sure to give you a boost into your vehicle while providing great looks too. That’s right, side steps and running boards look cool coming in a variety of styles and colors. From round to straight to flat, or power retractable steps, we have what your truck, Jeep or SUV needs.